The stuff of Greek mythology is packed to the brim with larger than life gods, powers, and tales that mix the human condition with the grandiose cosmos. Epitasis (EE-pit-uh-siss), which is derived from Greek and is aligned with the idea of intensity, refers to “the part of a play developing the main action and leading to the catastrophe,” according to the Merriam-Webster definition. While this site is not specifically geared toward games or the gaming community on their own, the significance of video game soundtracks, scores, and composing is certainly a sub-field of relevant note. The “Epitasis” being created by Lucas Govatos is not one of theatrical or thespian proportions, even if the resulting reactions from his endeavor garners a comparably dramatic emotional reaction. No, rather, this development of creative action exists in the realm of independent games; video games to be exact. A developer from Annapolis, Maryland, Govatos has been a longtime supporter and user of Unreal Engine – a platform equipped with tools for developers and designers to build games from the ground up – and “Epitasis” is Govatos’s newest undertaking in the gaming world, which is one part puzzle, one part open-world exploration, one part soundscape, and one part fantasy dimension. This description alone, digs up reminiscence of acclaimed titles like “Myst”, “Journey”, “The Witness”, and even, at least to a visual extent, “No Man’s Sky.” Beyond the adventure-piquing narrative that introduces gamers to the world of “Epitasis,” the written word is but one fraction of the many ways Govatos strikes chords of curiosity in those that visit his now active Kickstarter campaign for the game. Govatos promotes himself primarily as a developer but spares no drop of passion in explaining an artistic side of his mind, which is as clear as the seamless hues of color splashed across still shots of Epitasis’ landscapes. 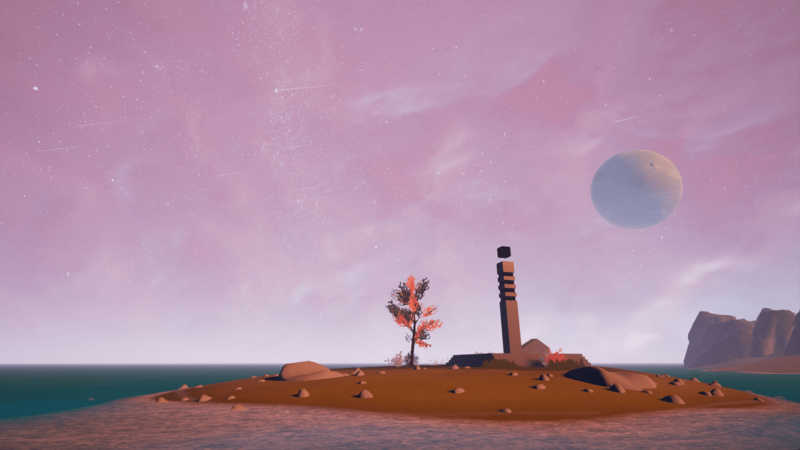 “I’ve been working on this game for roughly a year now – fragments and images of it have been in my mind for as long as I can remember; visions of wide open green plains, large alien moons, metallic ruins dotting the landscape, huge alien forests to climb and sprawling alien cities to navigate. The specific images Govatos has created for “Epitasis’” worlds are his own design but, it’s from this point in his creative process, where an accompanying appreciation for the music and design aesthetic of ambient-electronic artists like Tycho and Boards of Canada shines. Especially for the former, colorful visuals and fantastical landscapes are a nearly inseparable part of his artistic identity. Tycho, (real name Scott Hansen), who doubles as a graphic designer, is known for unique cover art and his ability to transfer a visual motif from an album to several other forms of visual media rendering them instantly identifiable – like video, tour posters, clothing, and more. Once past the game’s crisp and colorfully striking appearance, the soundtrack being composed by Pejman Roozbeh, stage name Funk Fiction, swoops in like a perfectly paired second course, to then give players’ ears something equally intriguing to digest. Tycho’s influence rings out loud and clear but Roozbeh is no caricature composer. The trailer / main theme music composed thus far plays out like a stylistic homage more than anything; with great attention to detail given by way of instrumental and hardware application, as the Access Virus and Minimoog Model D (two synthesizers preferred by Hansen) make appearances in the mix. This introductory two minute track ushers in a flow of energy that embodies what makes a piece of Tycho-style of ambient-electronica as situationally flexible as it is. The rounded, laser-like, tones that comprise Funk Fiction’s primary melodic motif come only after a steady build up of calmer, more widely radiating sounds that include: wave tones that imitate the sounds of blustering wind and expanding and long sustained tones that hit the ears and then remain for several moments thereafter, much like the ripples made from stones dropped in still water. Funk Fiction’s ability to transition between these individual sounds, as well as to shift the overarching energy level of the whole piece from serene and meditative to poised and spirited, falls right in line with “Epitasis’s” picturesque but venturesome premise. Right now, backers of “Epitasis” can give as little as $15.00 USD (toward the $11,650 goal) for a copy of the game, an instruction manual, and Kickstarter Exclusive UHD wallpapers (at time of publishing, the $10.00 tier just for a copy of the game has sold out). Tiers for rewards go from there up to as much as $150.00 USD for triplicates of the $15.00 rewards, along with digital art books, the incoming soundtrack, Beta tester access, and even one’s name placed on ruins in the game! Perks in between span everything from extra game access keys, to shirts, and physical art prints as well. Govatos hopes to reach projected goal, which will help refine the game and cover costs for things like retail sales, distribution and software licensing (eventually “Epitasis” will be expanding from just Mac/PC, over to the Xbox One, and PlayStation 4). Not to mention proper compensation for those who have helped Govatos with work like programming, concept art, and of course, composing. The more funds backed to the game, the more goals and offers Govatos will be able to create to enhance “Epitasis’s” immersive experience. The campaign is slated to end on 18 August 2017. Keep up with “Epitasis” through its official website and Facebook. Find Lucas Govatos on Twitter @LucasGovatos.